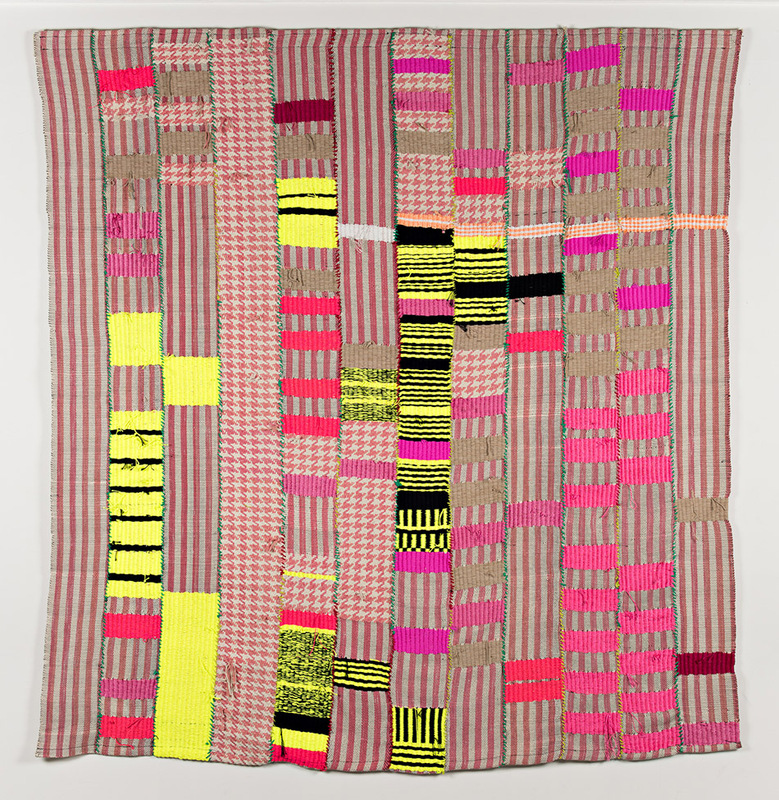 Frenetic textiles combine painting and sculpture, West African weaving and European tapestry, blunder and intention, domesticity and the wilderness of the imagination. 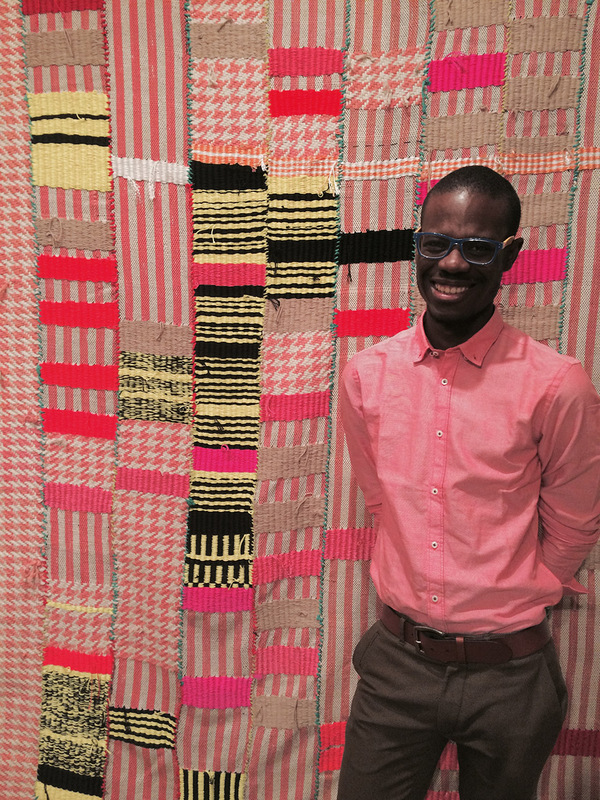 Diedrick Brackens conjures the spirit of a homemaker and a myth-maker. 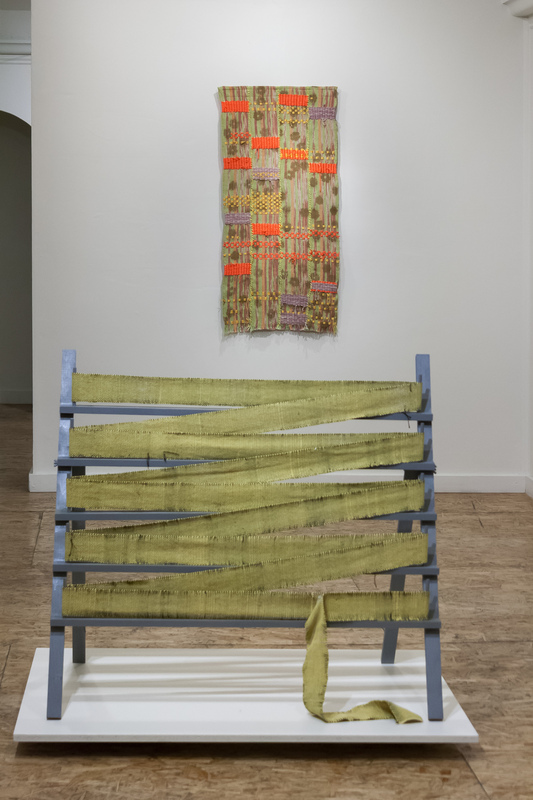 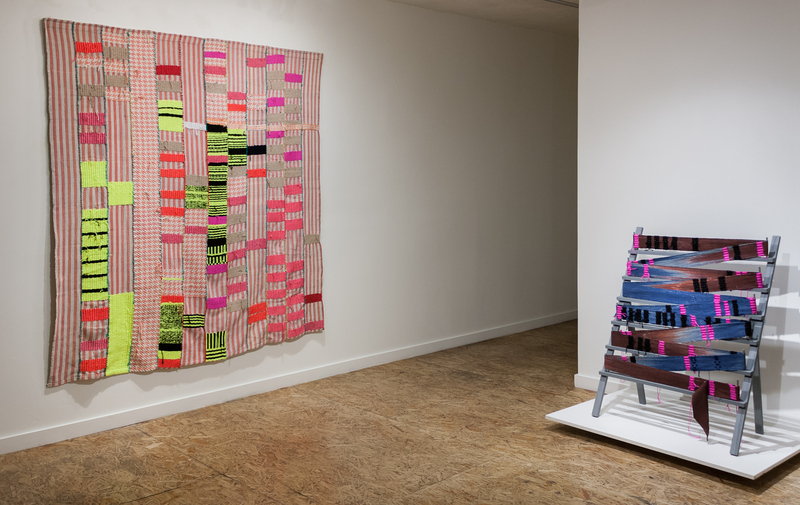 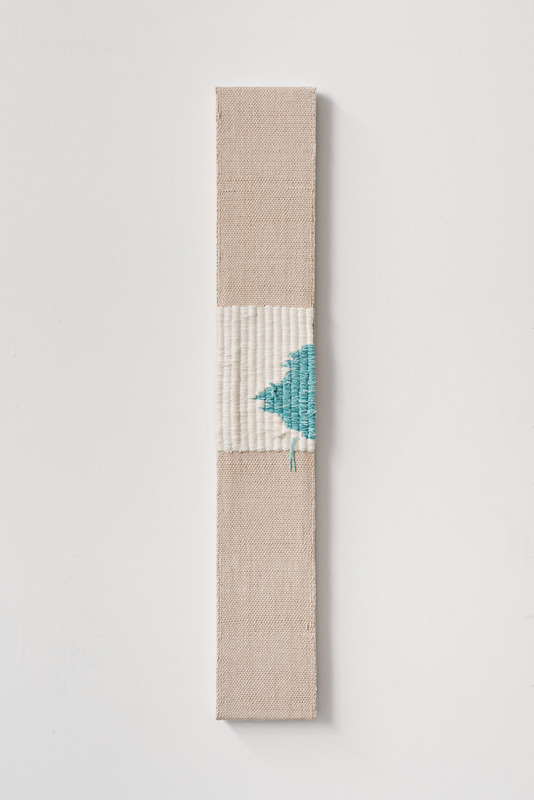 In his exhibition at Johansson Projects, “This is Real Life,” Brackens weaves colorful textiles that align domestic spaces with the infinite expanse of the imagination, though perhaps not quite immaculately. 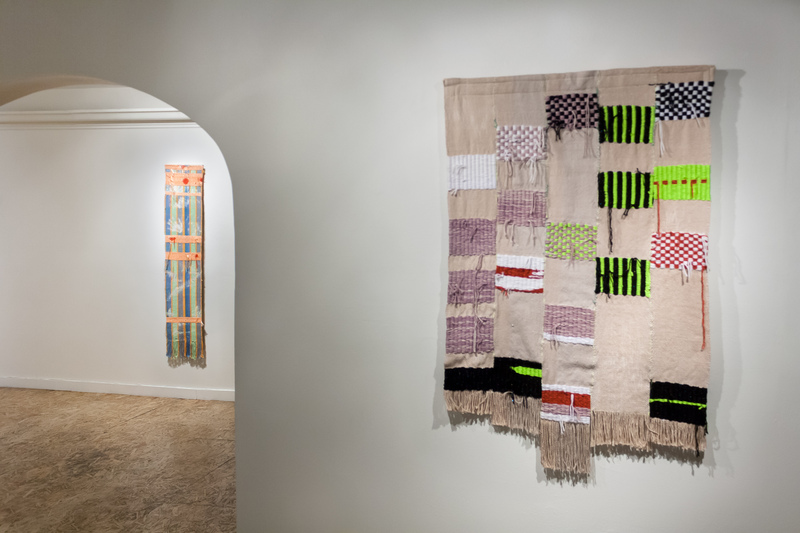 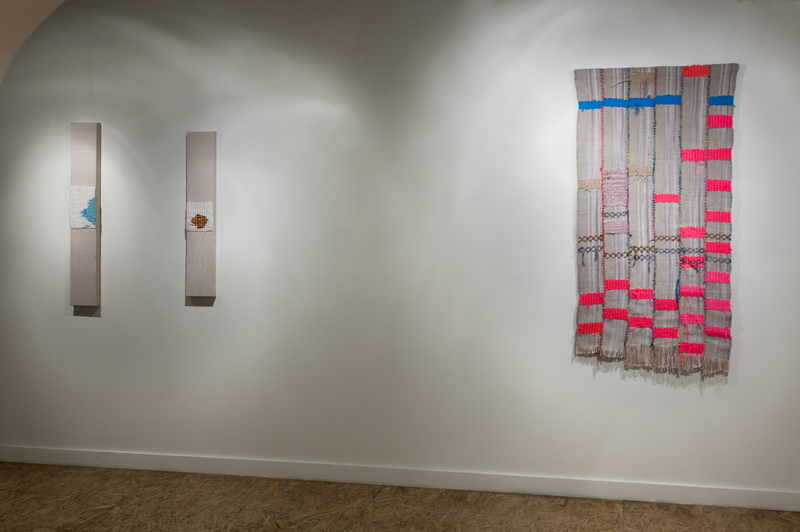 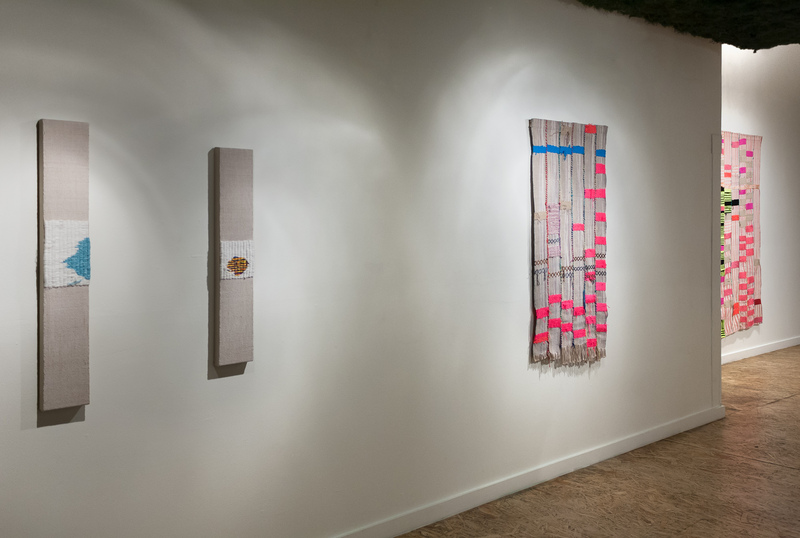 His category-jamming works rest on both wall and floor, with his weavings balancing the pictorial properties of painting and the textural elements of sculpture. 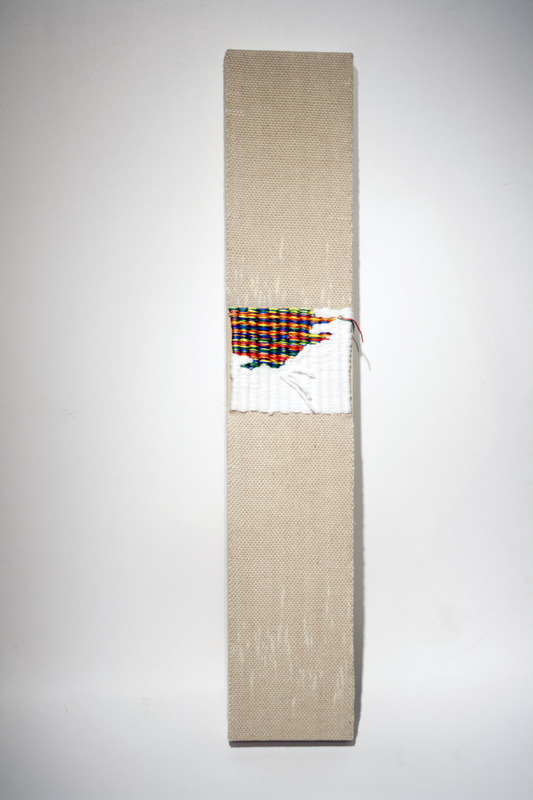 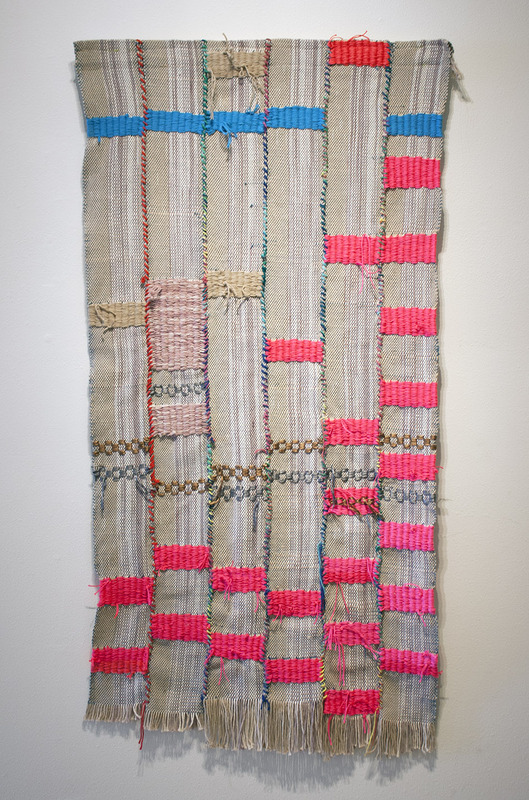 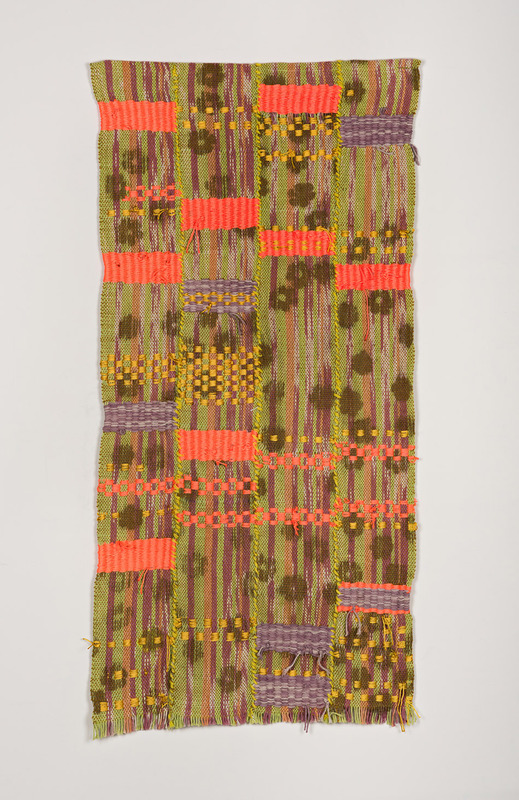 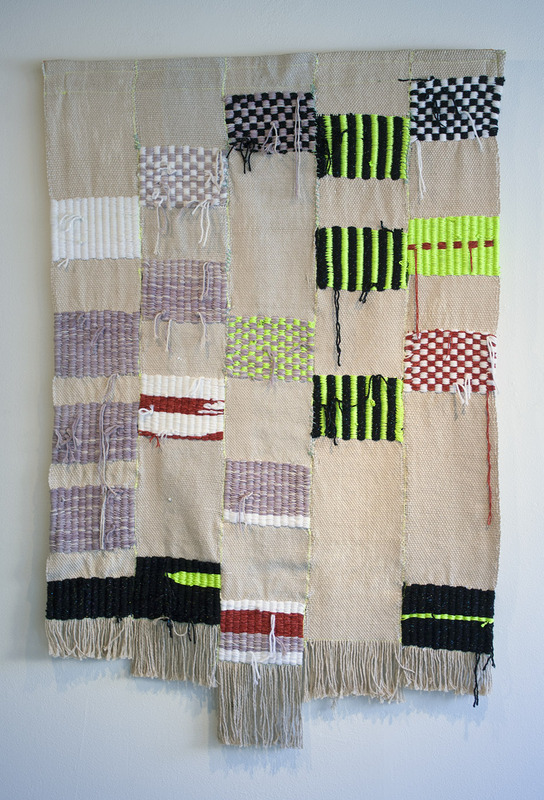 Each woven thing evidences traces of European tapestry, West African weavings, and Southern quilting techniques, though through the course of its creation each work begins to speak its own language. 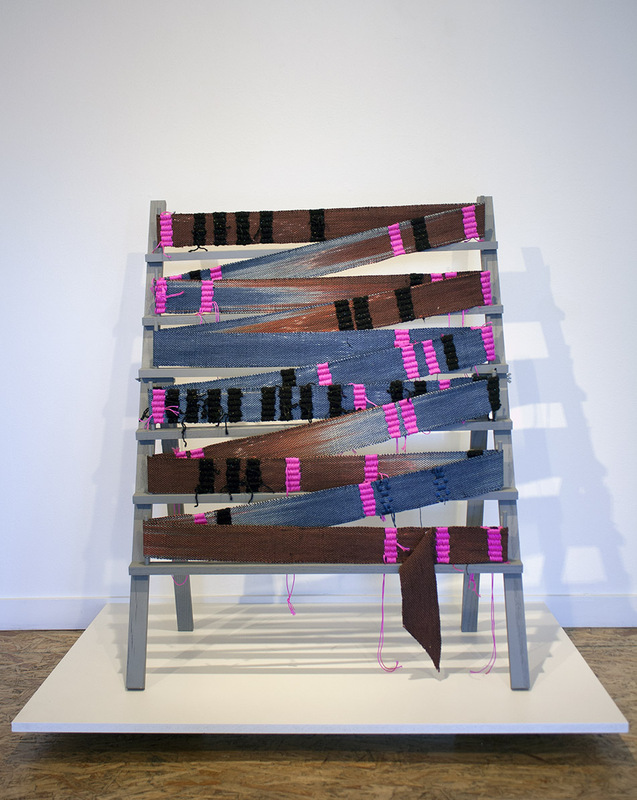 Some of Bracken’s colors in the weavings are derived from commonly found commercially dyed yarn while others, made from tea, wine, and bleach allude to gay vernacular, bodily fluids, cleansing and domesticity. 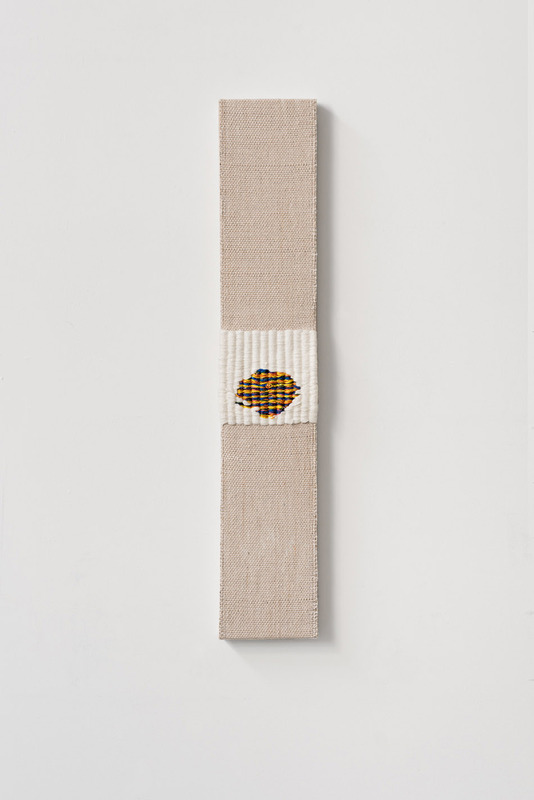 Focusing on the intersection of blunder and intention, dye and stain, whole and broken, Brackens evokes a feeling but invites the viewer to fill in the blanks. 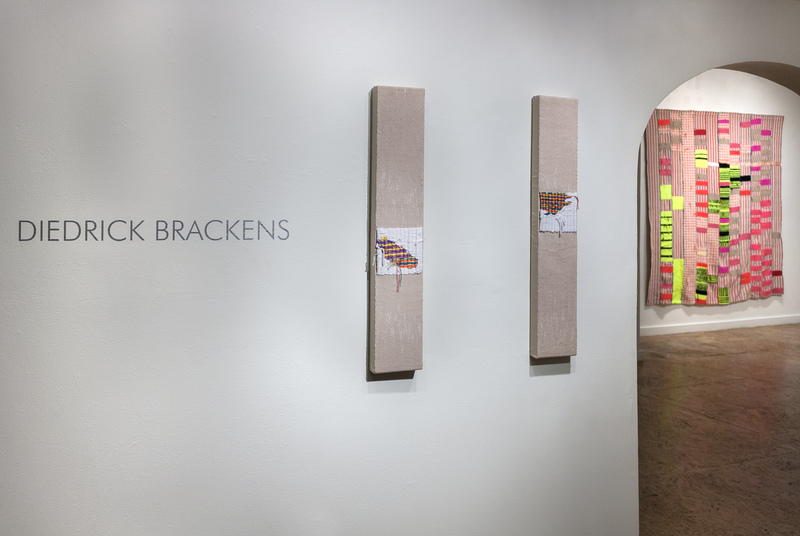 Diedrick Brackens earned his Masters of Fine Arts from California College of the Arts where he was the recipient of the Barclay Simpson Award. 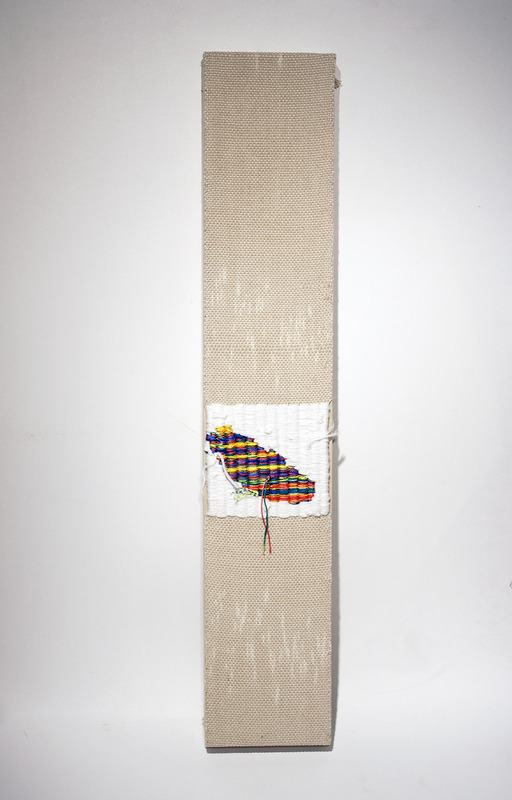 His work has been featured at the Berkeley Art Museum and the 3rd Ghetto Biennale in Port-au-Prince, Haiti in 2013. 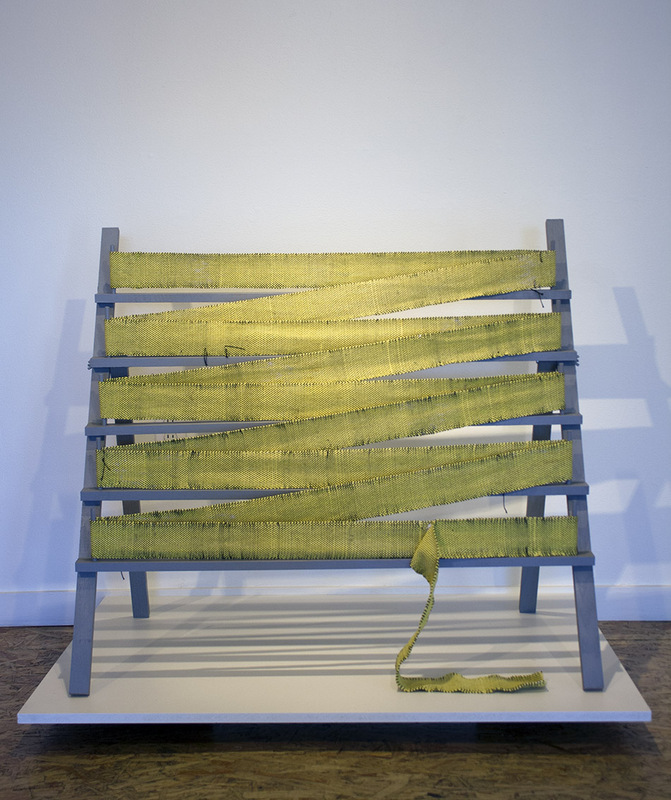 He is a Visiting Assistant Professor of Art at the University of Oregon. 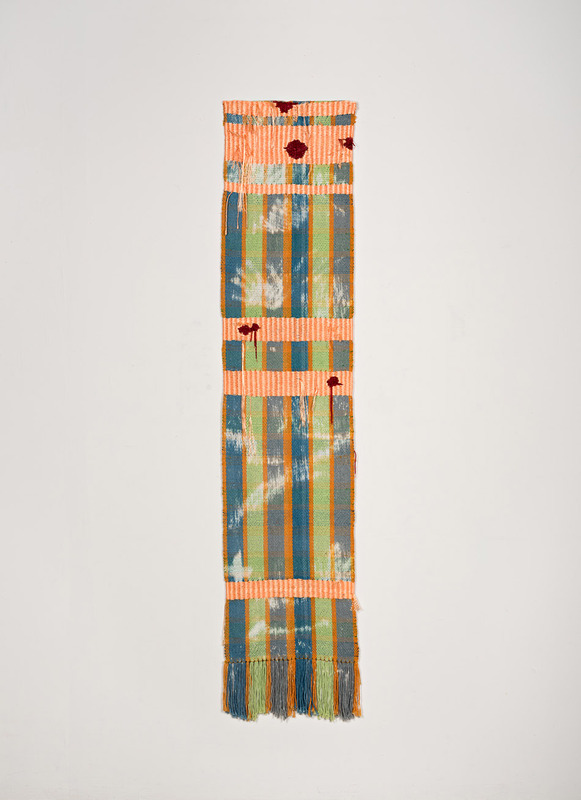 diedrick brackens // untitled - Hand woven and sewn fabric, nylon, cotton dyed with tea and commercial dyes; 84" x 81"
diedrick brackens // and see what happens - Hand woven fabric, cotton dyed with tea, acrylic yarn, and nylon; 6" x 35"
diedrick brackens // Martell's bouquet - Hand woven fabric, cotton dyed with tea, acrylic yarn, and chenille ; 6" x 40"
diedrick brackens // is it noticeable - Wood, hardware, hand woven fabric, commercially dyed cotton, nylon acrylic; 43" x 34" x 20"
diedrick brackens // disconnected, drown, drench - Hand woven and sewn fabric, cotton dyed with tea and wine, nylon, commercially dyes cotton, and polyester yarns; 58" x 30"
diedrick brackens // blat - Hand woven fabric, tea dyed cotton, acrylic, nylon; 6.5" x 35"
diedrick brackens // blatent - Hand woven fabric, tea dyed cotton, acrylic, nylon; 6.5" x 35"
diedrick brackens // tired of talking - Wood, hardware, hand woven fabric, commercially dyed cotton; 37" x 42" x 25"
diedrick brackens // one long look - Hand woven and sewn fabric; cotton dyed with tea and wine, nylon, acrylic, and chenille yarns; 48" x 33"
diedrick brackens // leave soil behind the ear- for AA - Hand woven and sewn fabric, cotton dyed with wine and commercial dyes, nylon, and acrylic yarn, spray paint; 48" x 23"
diedrick brackens // 10-79 - Hand woven fabric, nylon, chenille, hand dyed cotton, bleach; 66" x 14"